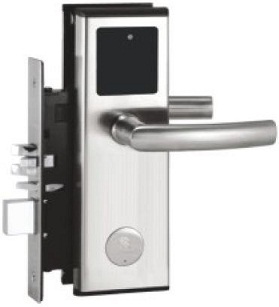 A Standalone battery operated Smart Card Based Smart Lock Systems, It could store 500 trasactions, designed especially for Hotels, Service Appartments, Residencial Appartments. Also at the lowest cost and the least workload. Reaching the requirement of GB374-2001 for material thickness, new double complex structure is applied. It is firm and resists corrosion. Stainless steel handle with reasonable structure, good holding and durable. US standard lock case with reasonable structure and security. Don't disturb function, when guest turn on the dead bolt the LED flash and red light indigate "do not disturb". Rotary structure makes the handle feel more comfortable for using.